1: First Step To Join Click Here! Copy the HTML code for the Web Ring. Paste the Panel Code to the same page the ring will enter on (this is not optional!). Email me at taron@birman.net to let me know the banner has been added. 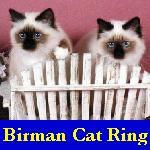 This Birman Cat Web Ring Site is owned by Ron Thayer. Want To Join the Birman Cat Web Ring? Click Here. Once again, modifications to the look of this web banner are fine! just as long as the code for changing sites works. I hope to welcome you to the ring soon.